Toyota Tacomas are now more than just trustworthy trucks. Toyota’s revolutionary in-car tech provides integrated multimedia navigation that gives drivers access to a hefty suite of Apps and data services while including Bluetooth, voice recognition, USB and auxiliary outputs, and a colored display. With Toyota’s Entune App Suite 7 drivers have access to Bing, iHeartRadio, MovieTickets.com, OpenTable, Pandora, and the newly added Yelp and Facebook Places, as well as data services ranging from stocks, weather, traffic, fuel prices, and sports scores. Entune Audio’s in-car hardware features a 6.1”-8” color touch screen display that features the normal AM/FM radio frequencies paired with a CD deck, a USB and auxiliary port for iPhone use, and a Bluetooth tethering feature to allow pairing with smartphones. From pairing the system with you smart phone your phone book becomes accessible via Entune, allowing hand free phone calls to be made thanks to the advanced voice recognition. The system allows a total of 2,500 contacts to be stores in the audio head unit, with a cap of four phone numbers per listed contact in the phone book. When Tacomas owners have the Entune app on their smart phone, Entune syncs together between the Tacoma’s in-car system and the phone enabling use of iHeartRadio, Pandora, and XM Satellite Radio. The smart phone app is available for iOS, Android, or Blackberry applications, and a cell phone data plan is required to fully benefit from the tandem use of the cell phone app and in-car dash system. The features may be accessed using voice recognition, the steering wheel control, or the in-car touchscreen. 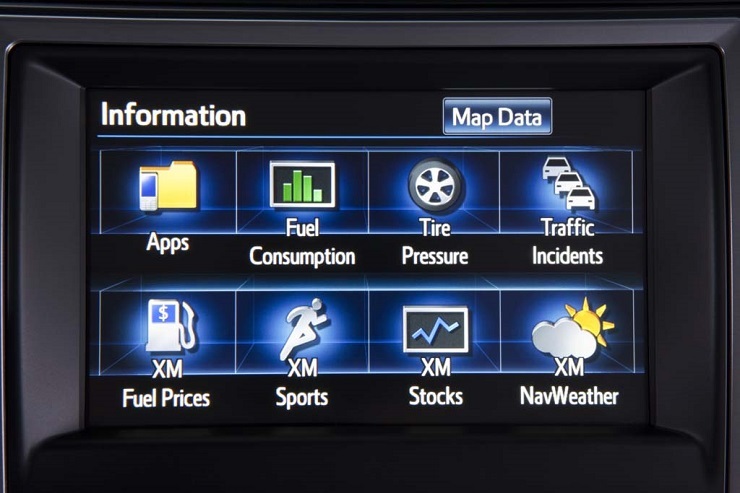 The advanced voice recognition includes “Safety Connect,” Toyota’s subscription-based telematics system that provides roadside assistance, car safety, remote diagnostics, and other services made available to drivers. Now, Entune App Suite service is included into the price of Tacomas equipped with Entune App Suite, making it so there is no activation fee or reoccurring monthly fees required. Safety Connect is not included as it is a separate service that requires paid subscription once the included first year trial is over. Toyota is continuing to listen to customer’s feedback regarding preferred apps for future Entune App Suite updates. JBL Premium Audio package is readily available for those who really care about their music while driving. The upgrade gives a custom design to optimize your Tacoma’s acoustics, designated more speakers for more defined vocal and bass levels, and the system is precisely tuned to accommodate your Tacoma. The features provided from Entune gives a whole new experience to Tacoma drivers to an extent they’ll certainly be pleased with all while being equipped to tackle any job or obstacle, or to just make every day easier.